A splendid display of two beautiful hyacinths presented in a basket. Hyacinths are beautifully fragrant flowers that will blossom throughout the seasons and are simply perfect for Christmas. Hyacinths are very easy to look after and are available for UK next day delivery. Ideal for Christmas: also included is a FREE box of Belgian fine chocolates included. 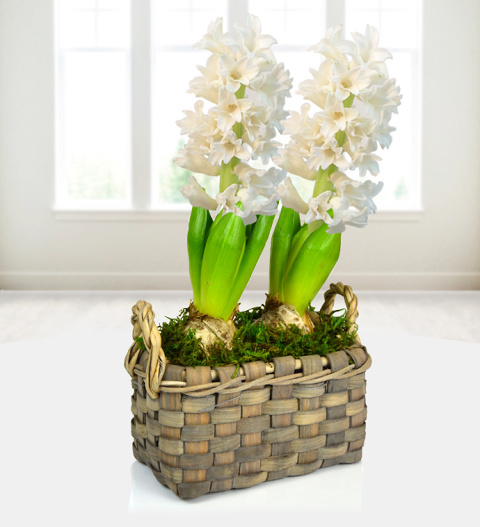 This Hyacinth duo basket is available for next day delivery. Please note, bulb colours may vary. Chocolates may contain nuts.